Join the discussion on our forums! 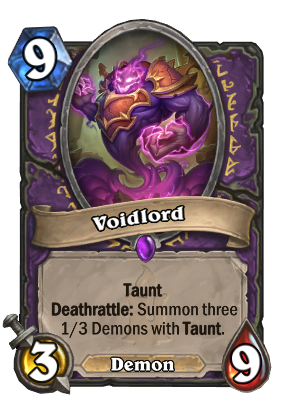 Come discuss Voidlord over in our dedicated Voidlord discussion topic. i hate it without cube already. Should be 1 or 2 attack instead of 3! 9 taunt that spawns 3 x 1/3 demons. 3 attack will just kill your opponents so easily. WHY ISNT THIS CARD NERFED YET?!?!? WTF BLIZZ?!?! HELLO? no its guldan that makes it op. No it doesn't. This card as a standalone is fine. The problem comes when you are able to get it out on turn 5. Playing this guy as a 9 drop from hand is far from OP. Worst card in the game, really destroys fun, you neeed to have Silence in the deck or some counters. The warlock needs nothing he can just spam his minions. The whole Cubelock deck is so boring, you know exactly how the game will play out in detail and if you have no silence its almost impossible to stop if you have a minion based deck. Not really much interaction. Yeah and even if you silence it but don't kill it, you still run the risk of the warlock being able to cube the silenced copy and summoning 2 more unsilenced copies. B U T I R E F U S E ! I S T H A T A J O J O R E F E R E N C E ? N O T R E A L L Y B U T O K .
Before Kobolds: Fairly useful late-game doorstop. After Kobolds: The death of fun. Voidlord itself is balanced. The problem is you get him for free from Possessed Lackey and Skull of the Man'ari, with zero drawbacks! That needs to get nerfed, not this. 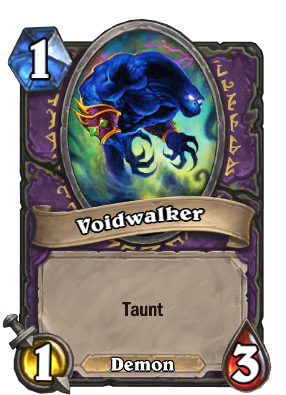 It's funny how the Possessed Lackey card was voted as a bad card while 90% of all locks who get voidlord by turn 6 or 5 (with the use of a mana gem) uses it.